"Photojournalist Steven Clevenger got his start in 1971 in Cambodia, when he was just 22-years-old. He has covered seven wars, including those in Iraq and Afghanistan. In 2006, Clevenger began a three-year project documenting the warrior tradition of soldiers serving in Iraq. 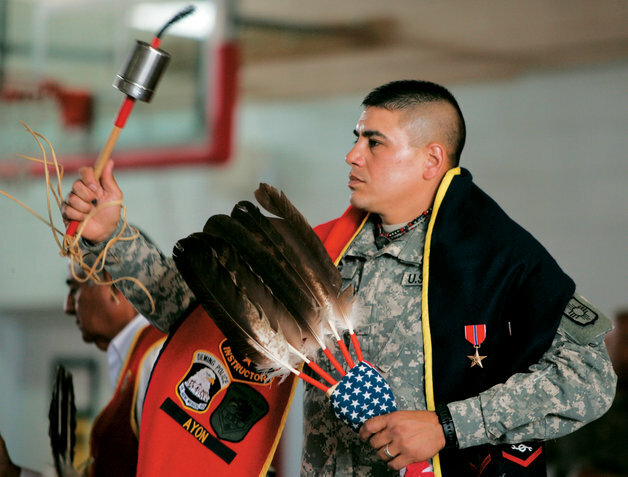 His work resulted in his book, America's First Warriors: Native Americans and Iraq. As an Osage and a war photographer, he was fascinated by modern Native American warrior culture. The definition of warrior, he writes, has been basically the same since pre-Columbian times: "A warrior is the protector of his people." The same values inherent in that code — loyalty, duty, respect, selfless service, honor, integrity and personal courage — are elements necessary for a successful U.S. Military career. Clevenger spent time embedded with Native American military members in Iraq in both 2007 and 2009. He took photographs and interviewed Apache, Navajo, Osage, Pueblo and other Native military members, capturing how their culture affected and informed their wartime service. "